I continue to be charmed by my latest project, a crewel-work sampler. After I complete every line, color or petal, I hold it out and admire how sweet it looks. 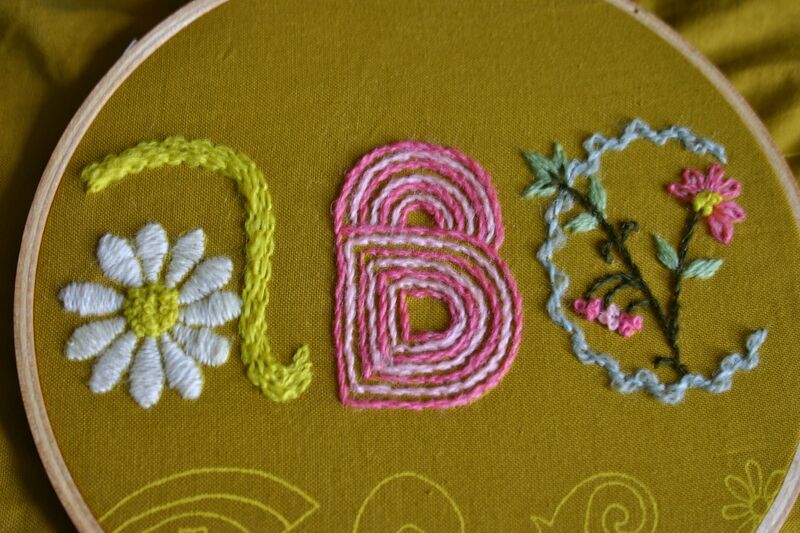 I’m also enjoying the forgotten memories that this project is bringing forth as I stitch each letter. When I was a kid in daycare during summer months, they would step up the activities since we were there all day long. I remember that on Wednesdays we would go to the city pool and swim and eat cherry sours and hot fries. (That was probably my favorite day of the week back then.) On other days we would do craft projects. We had this one teacher, Miss Patti that was really into cross stitch. I still remember learning how to cross-stitch on a square of orange gingham fabric. I wonder if I ever finished stitching that sailboat, and what has happened to it over the years. I also remember my Nana showing me how to embroider a sparrow on a pillowcase a few years after that. She always had pretty embroidered pillowcases and I think I asked her to show me how on a whim one day, and she did. Just like the time I asked her on a whim to show me how to knit. My Nana, she’s a wonderful lady. I’m starting to realize as I get older how much she and I are alike, and I’m so happy when I come across something new about myself and then look back and see that it was inspired by her. I wonder whatever happened to that sparrow pillowcase. I bet my mom has it somewhere in her linen closet. I’ll have to ask her about it next time I’m there because it’s something I would love to have again. So pretty! I need to get started on my project, too. The yellow is a little intense for me — I’m thinking about ordering a different shade. Isn’t it funny how doing something can bring back so many memories? I remember my grandma showing me how to do French knots on a hot day when we took refuge inside in the a/c. Cuter than cute! Keep it going!